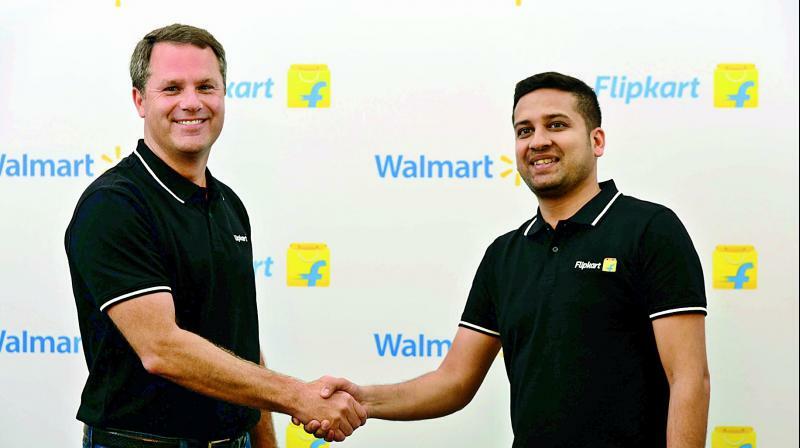 American retail giant Walmart Inc is picking up a 77% stake in Indian online retailer Flipkart for $16 billion in the largest e-commerce deal ever struck anywhere in the world. The deal values the 11-year-old Flipkart at approximately $21 billion. This catapults the poster boy of Indian e-tail to among the most valued internet startups in the world. It also brings to an end the independent run of Flipkart, founded by two IIT-Delhi engineers, which spawned a brand new generation of internet entrepreneurs in the country. The stunning success of the unrelated Bansals - Sachin and Binny made startups mainstream and helped the ecosystem attract an unprecedented inflow of capital from foreign investors. The transaction, which was officially announced on Wednesday, has been in the works since 2016. It entails Walmart ploughing $2 billion into the company as primary capital. The rest of the stake for Walmart will come from buying out existing investors like Japan’s SoftBank, Tiger Global (an investment fund based in New York) and South African media and internet group Naspers, among others, at a valuation of $19-20 billion, sources close to the matter said. Online search engine major Google's parent, Alphabet, is likely to pump another $1-2 billion, separately, later in the year, sources said. Flipkart’s co-founder, chairman and longest serving CEO, Sachin Bansal, sell off his 5.5% stake and exit the company completely. Binny Bansal, the other co-founder, will stay on as the group CEO, and go on to take the executive chairman's role at least for the next two years, as part of the terms of the deal.